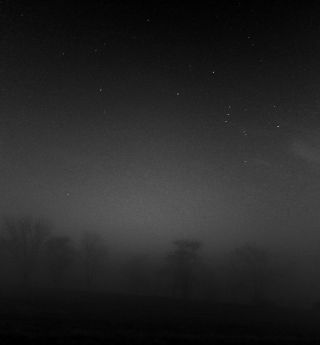 The constellation Orion, known in Greek mythology as the hunter, shines brightly above the fog in this image. Michael Plishka took this photo from Lake Villa, Illinois on Nov. 20. The constellation Orion, the hunter, and the mighty planet Jupiter are clearly visible in two night sky photos, despite a very foggy Illinois night. Astrophotographer Michael Plishka took these photos from Lake Villa, Illinois on Nov. 20. The largest planet in our solar system, Jupiter, shines above dense fog in this photo. Michael Plishka captured this image from Lake Villa, Illinois on Nov. 20. “The heavy fog created a great effect where stars were visible above the fog,” Plishka said. Orion is one of the most recognizable constellations in the sky. It includes several prominent stars including Betelgeuse, Rigel and Bellatrix. Seven of its brightest stars form an hourglass shape in the sky. Jupiter is the largest planet in our solar system and one of the brightest objects in the night sky.